dascollectiv: Little Trumpeteer going Indiegogo! 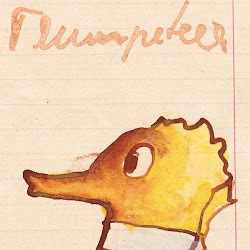 The little trumpeteer is a character that comes to life in a dialog between music and drawing. In the end this is about an app. You can move this little character, the little trumpeteer, you can shake it, dance, blow his horn. You can create stories with movement and music. Creating Stories and creating music, that's what it is all about. Right now we are in the process of doing little animations to give a picture of how this app can look like. Hangouts are a spontaneous method to show what it is all about, where we can create little improvised stories in a dialog between music and drawing. This is one amazing project. Based on the idea of supporting entrepreneurship in Europe, a very nice team (http://www.entrepreneurship.de/gruender-garage/team/) with Günter Faltin in the middle has coupled up with Google Germany to encourage and help ideas to develop. It is a competition and Google is donating up to 150.000 € to double ideas with up to 10.000 € each. The little trumpeteer is a beginning, a first example project to be put into life to visualize our vision. Anyhow this is not where we stop, this is just where we start. We want to connect different art forms and contemporary media, to find adequate ways of making a living out of artistic visions. Copyright and that kind are coming to an end. There are some discussions about the materialistic value of ideas as such, for instance patents and digital work. We believe that the main problem in thinking is the approach one is taking. New media calls for new utilization. And we believe it actually is the artists who can benefit the most out of zero-cost copying. Be sure to have a chat with us on this topic if you are interested. We need support for Software and Hardware, so that we can tell the stories of the little trumpeteer in the best possible quality, in the quality that matches our expectations. We did some calculations, and to get the project started, to be able to create animations, music, art and first beta applications, already 1.500 € will be enough. 1 € or more: Updates on all the activity concerning "art goes social/mobile", "dasCollectiv" and "the litte trumpeteer". 5 € or more: a personal Thank You message in the social network of your choice. 10 € or more: a personal Thank You message on a "little trumpeteer" - postcard shipped to you by snail mail. 25 € or more: the Little Trumpeteer Media Abonnement, the finest output of this project, sent to you by eMail. 250 € or more: a very private concert, fine music with fine wine, just for you and your accompaniment in Vienna/Austria. We encourage you to suggest additional perks, the following is what we think is most reasonable, however feel free to state your idea. 50 Trumpeteers or goal achieved: unlocks Dedicated Trumpeteers and Beta Trumpeteers. 80 Trumpeteers or more than 2500 €: unlocks Trumpeteer Audio-CDs. 120 Trumpeteers or more than 3500 €: unlocks Trumpeteer T-Shirts. Dedicated Trumpeteers will receive merchandising products while Beta Trumpeteers will receive beta applications, for testing, and hardware such as the Google Nexus 7, for testing and private use. For each hardware device there will only be a limited amount of perks available. Marie-Theres Gallnbrunner (http://www.mthg.net), artist and art therapist. Christof Spanring (http://ww.christofspanring.com), musician and mathematician.